Moving out of Ann Arbor, first to Japan for a couple weeks and then on to New York, so blogging will be sparse in August. Inflation hawks have predicted 10 out of the last zero inflations. Japan printed Space Battleship Yamato-loads of money and inflation went from negative to just over zero. More recently, the Fed's massive asset purchases and ardent promises to keep interest rates at zero until the heat death of the Universe have not pushed core inflation higher than the 2% target. Furthermore, slack demand from Europe and China do not bode well for a robust global recovery in the next few years. Additionally, markets expect very low inflation for a long time to come (and second-guessing the market is always a gamble). Also, the Fed seems to have a good number of influential members who think 5% inflation would be a calamity far worse than 8% unemployment. And finally, liquidity-trap New Keynesian models of the macroeconomy, which recognize the importance of the Zero Lower Bound of nominal interest rates, seem to me far more credible to me than the flexible-price models that predict higher inflation. To sum up: Inflation looks incredibly unlikely to me at this point. So why on Earth did I just bet Brad DeLong dinner that the U.S. economy will experience substantial inflation at some point during the next three years? Short answer: Dinner with Brad DeLong at Zachary's will be fun even if I lose. Longer answer: I got 50-to-1 odds on the bet (if I win, Brad buys me dinner and pays me 49x the cost of dinner). That means that I am essentially betting that there is a 2% chance that something really funky happens to the global economy over the next three years. What kind of funky thing would cause inflation to go over 5% even as unemployment stayed over 6% (as per the terms of the bet)? Perhaps the Chinese state will collapse, disrupting supply chains and sending import costs soaring; or perhaps the Saudi state will collapse, sending oil prices soaring. And perhaps the Fed will be spooked so much by these events that it would allow 5% inflation as a hedge against global economic collapse. Or, alternatively, perhaps the models (or mental model-sketches) used by John Cochrane, Steve Williamson, Jim Bullard, Charles Plosser, Narayana Kocherlakota, and other inflation hawks are much more right than I realize! I always talk about the basic ignorance of macroeconomists about how the economy works, so in a sense I'm putting my money where my mouth is. Am I giving Brad a great deal by not demanding 100-to-1 or 200-to-1 odds? Probably, yes. In fact I was going to demand 100-to-1 but I felt it would be rude. But small probabilities are notoriously hard to estimate, or even guesstimate. So instead of expected utility maximization, I'm using a different decision theory rule, limiting my potential losses. The worst that can happen to me is that I will have to buy Brad dinner, during which he will probably laugh at me. plus, betting that the fed is behind the curve is never a bad bet these days. your betting that the economy recovers and the Fed gets behind the curve on inflation. I'd say a more than 2% chance that happens! "plus, betting that the fed is behind the curve is never a bad bet these days. your betting that the economy recovers and the Fed gets behind the curve on inflation. I'd say a more than 2% chance that happens!" As Noah has implied, not a chance in h*ll. The Fed's second job (after bailing out Wall St) is to kill inflation. They won't screw that one up, and it's easy to do. They'll also have massive backing from Wall St, so it's like a team wrestling match where you have a Terminator on your team. if its so easy to screw up, why should i be so confident they will not screw it up? economic forecasting is less accurate than long term weather forecasting. as they say, the world is paved with good intentions. is this the mean scenario, no. but the tails of the distribution are fatter than people imagine, and i can imagine a lot. oh, and the original Terminator was reprogrammed to work for the humans. what is that ... thing ... in the illustration? It looks almost like a pizza. That's "Chicago School" pizza! See how inflated it is? "... perhaps the models (or mental model-sketches) used by John Cochrane, Steve Williamson, Jim Bullard, Charles Plosser, Narayana Kocherlakota, and other inflation hawks are much more right than I realize!" And who knows, maybe the horse will sing. The most likely scenario to me would be for Israel to bomb Iran which would respond by closing the straits of hormuz, leading rising oil prices. What on god's green earth is that thick, doughy concoction depicted in the photo? And what is it doing atop a post that is ostensibly about pizza? 2. I'd put the odds of FED action to boost inflation above 5% at trivially close to zero, but the odds of a major supply shock at >2%. Seriously, can we honestly say there is a less than 1-in-50 chance of a major supply disrupting war in the Middle East? 3. Last I heard, the universe was due to die a cold death rather than heat death, though there is disagreement on this. What odds will anyone give on that bet? A China collapse might make it difficult to obtain some things but probably not cause price increases. The Asian financial crisis lowered costs. An oil crisis would most likely lead to economic collapse rather than inflation. Higher oil prices just mean that much more money being stored in tbills. Global warming leading to a food, transport, water, electrical crisis along with storm disasters, that would be much more likely to cause inflation. I am sure Cochrane will be pleased with your ringing endorsement. Thank you. I was worried about your "Cochrane could be right" post. In the long run we'll all be dead, too. Now I see that you know to take a bet when you win no matter the outcome! I would say that maximizes utility, even if your pleasure at losing is outside any model. Good work after that last - shaky - post. And I do agree that the dinner will be fun. 1. Price increases are not necessarily inflation. One has to understand the cause of the increase and how it comes about. A new six percent sales tax is not inflation, if disclosed to the consumer. So, why is a six percent sales tax increase, concealed and not disclosed, inflation? 2. The models of Cochrane, et al, do not predict inflation, for they offer no means or method (perhaps your word would be microfoundation) for high bank reserves to get into the hands of consumers. 3. The key driver is still the price of oil. Romney, fool that he is, just assured that, even if elected, he will have a miserable 4 year term because he just went, for no good reason whatsover, and stuck the sharpest stick he could find in the eyes of the Iranians. My god, but do people how realize what kind of idiocy he just displayed in Israel. What if FDR had committed such equally stupid acts toward Japan, before WWII, or Wilson v Germany, WWI. Dale Carnegie can be bought for $1.99 on Alibris, plus shipping. "What if FDR had committed such equally stupid acts toward Japan, before WWII"
FDR was deliberately strangling the Japanese economy to try to force them to withdraw from China. Japan had to either give up on its imperial project or attack the United States - and both sides knew it. FDR was willing to take the US to war for the sake of China (much good it did) and apparently Romney is willing to take the US to war for the sake of Israel. Sorry - wanted to add that I agree that Romney went from being merely really, really stupid in London to being a global menace in Israel - handing the Israelis a blank check to start a war. Hmm. Upsetting the US's closest ally, followed by antagonising the US's most dangerous enemy. He's either insane or a closet Al-Qaeda stooge. "Japan printed Space Battleship Yamato-loads of money and inflation went from negative to just over zero." Best description on an economics blog I have ever read! What happens if the midwest drought continues, a deep drought crops up in Asia, and we start a war with Iran? I could see all of that happening simultaneously which could really drive up even core prices. 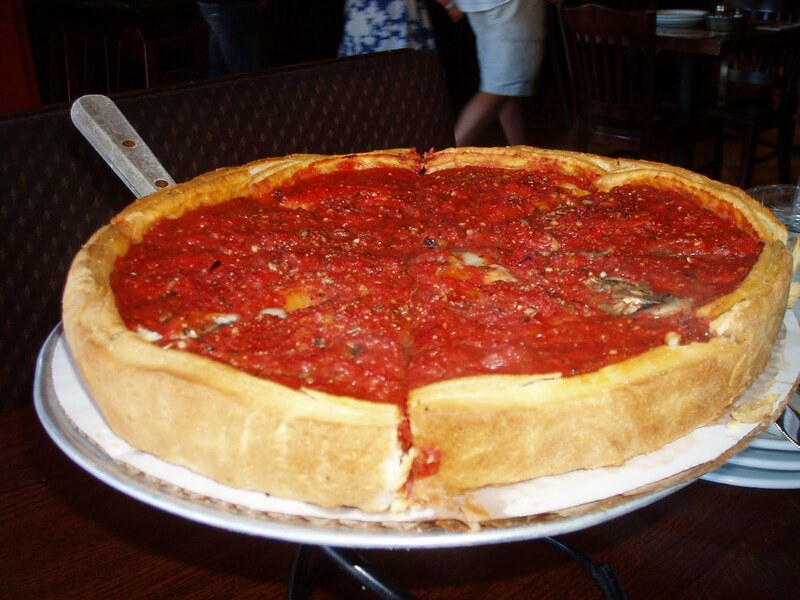 Deep Dish Pizza is a true pleasure under any circumstance. I support and endorse this comment. "second-guessing the market is always a gamble" - that's actually quite witty. "Also, note that if by some odd twist of fate Brad loses the bet, not only will it be good news for the economy (5% inflation would really help us out)"
For Brad to lose wouldn't unemployment also need to be greater than 6%? It appears to me that Brad will lose only if there is 'stagflation' which as you rightly point out could be caused by terrible supply shocks. How would that be good news for the economy? In a sense, any movement along the Phillips curve (or a shift in of the curve) would be a win for Brad and you would win only if the Phillips curve shifts out. i was wondering if as part of the agreement the bet would be marked to market, and if there was a pizza-out ("cash out") provision. So if at some point the odds have improved to (say) 10%, then you could settle for Pizza for you and 3 friends (as an example). Yeah, but you're betting on 5% inflation (with just 2% odds!). I remember a time when 5% inflation was widely considered low, not high! A lot of these people predicting high inflation are predicting Zimbabwe, or at least double digit; they're not saying 5%. This is a pretty bold thing of you to do, Dr. Noah Smith. People have predicted inflation and stagflation with regard to the U.S. economic recovery, and so far, it has yet to happen. I wish you the best of luck, Dr. Noah Smith! You know, you didn't need to nerd out with the reference to the "Space Battleship Yamato," since you could have just referenced the actual Japanese battleship Yamato. She is the record holder for the most powerful battleship ever built in history (in terms of firepower and tonnage), and her record was venerable--even though US aircraft landed 13 bombs and 8 torpedoes in her hull, it wasn't until her own magazines exploded that she sank. Add in the fact that reducing the debt load from where we are to where we can sustainably grow (not saying that this will be done, it wasn't in Japan) would take in excess of 5% (PA) inflation? That pizza looks incredible. Clearly I need to make a pilgrimage to Chicago...or Berkeley. I do need to caution you against eating what is laughingly called pizza at the SB student union, though. Words fail me. Just don't.